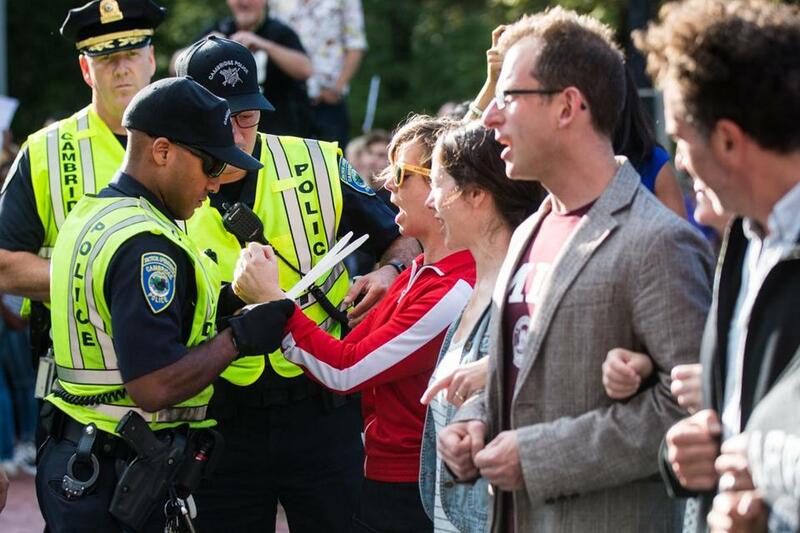 Cambridge police officers arrested professors after they locked arms and shut down Massachusetts Avenue next to Harvard University while protesting the removal of DACA. More than 30 people were arrested early Thursday evening in Harvard Square during a rally by educators to protest President Trump’s decision to phase out DACA, the program that protects young immigrants who came to the United States as children. The protesters were taken into custody around 5 p.m. because they were blocking Massachusetts Avenue, Cambridge police spokesman Jeremy Warnick said. They were charged with either disturbing the peace or disorderly conduct. Most of those arrested were from Cambridge, Somerville, and Boston though one 31-year-old man was from San Bernardino, CA, police said. The ages of the people who were arrested ranged from 25 to 59-years-old, according to Cambridge police. Cambridge police spoke to organizers prior to the rally and planned to send officers to the area to monitor rush-hour traffic, Warnick said. “We’ve been in touch with the organizers for several days now, so this is not a surprise to the department,” he said. A Facebook page for the rally stated that “a group of faculty from several area colleges will engage in an act of non-violent civil disobedience” by blocking Massachusetts Avenue until they were arrested. Faculty from Harvard College, Tufts University, the Massachusetts Institute of Technology, Wellesley College, and Babson College participated in the demonstration, according to the event page. Organizers and police anticipated the arrests, which occurred without resistance or violence, Warnick said. Officers asked protesters to clear the streets and continue the rally in a safer area, but the demonstrators planned in advance to refuse to move. “They were given multiple opportunities to continue their free speech, but off the main road, and they refused to move,” he said. At least 10 officers were assigned to the scene and instructed to block off several one-way streets leading to Harvard Square, Warnick said. “Essentially, we had to close from Putnam [Avenue] and [Massachusetts Avenue] all the way up to the Cambridge Common,” he said.